Over the weekend, we went to a family retreat with my in-laws up in Canada. If you never been to Canada, you are missing out! The nature, the atmosphere is wonderful. We all got a big cottage house by the river. It was surely relaxing, and the kids had a blast! My pregnant sister-in-law was making a salad, similar to this one and add cilantro. I am not a fan of cilantro, the smell gets me every time. But, she was talking about how much she loved it and it made me want the salad as soon as I got home. So, here you go: Israeli salad! Super easy recipe, and another great one for the summer. Although it is chopped small, it still contains big flavor and big benefits. Cucumber provides a great source of fiber and its perfect to use in summer salads such as this one because its refreshing and hydrating! Red onion benefits the bones by promoting their health and also treats acne. Last but not least, the cilantro. Not my favorite ingredients but its gotta go into your meals because it’s just so good for you. Cilantro improves your sleep. It also can protect against food poisoning as well as soothe skin irritations. Happy salad making! 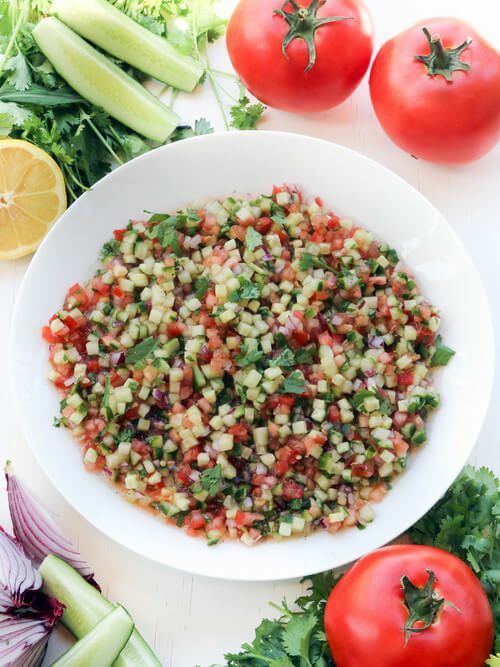 Chop 1 English cucumber, 2 large tomatoes, 1/2 of a red onion, and a handful of fresh cilantro.